Your home is your castle and you no doubt spend a lot of time in it. So why not surround yourself with inspiring and stylish home interiors that you love, giving you happiness. For me, beautiful and stylish home interiors equates to having my Sarah Jane Artwork on any spare wall I can find. 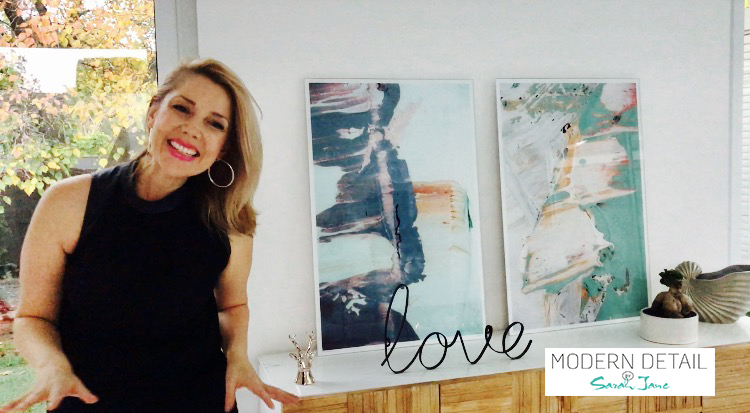 My Modern and Abstract, Original Paintings and Framed Art Prints are everywhere warming up my soul and engaging my mind. But what do I love most of all on my walls? Well, my favourite wall art that brings style to my home interior is actually my Sarah Jane Glass Prints! These really need to be seen to grasp how trendy and hip they truly are and lucky for you I’ve made you a video below so you can see for yourself. The reflective nature of the glass and the metallic art paper that my work is printed on really make this artwork pop, feeling like the Art Print by Sarah Jane has come to life. They will provide the finishing touches to your home interior whether it be a bedroom, lounge room or dining room and best of all the Glass Prints are Australian Made. So if you love modern homewares and furniture as I do, discover the beauty and style of Wall Art Glass Prints By Sarah Jane. Range of sizes available and delivery is worldwide.